Auguste Comte, a French philosopher and skeptic, was once belittling English writer, Thomas Carlyle, for his faith in Jesus Christ. Comte suggested that he might start a religion of his own to replace Christianity. "Very good," responded Carlyle. "All you need to do is to be crucified, rise again the third day and get the world to believe that you are still alive. Then your new religion just might have a chance." No religion in the world can match the claims of Christianity. What differentiates it from other religions is its declaration that Christ literally rose from the grave. There have always been those who have sought to debunk the resurrection of Christ, but whatever arguments have been offered fail miserably. Harvard professor Dr. Simon Greenleaf summed it up well, when he said, "According to the laws of legal evidence used in courts of law, there is more evidence for the historical fact of the resurrection of Jesus Christ than for just about any other event in history." Indeed, and the ramifications of that one event in human history – the resurrection of Jesus – gives us seven great assurances for life. The resurrection of Christ assures us God has accepted Christ's sacrifice for our sins. The resurrection is proof that Jesus is who he claimed to be – the Messiah – the Savior of mankind – and that his sacrifice on the cross was pleasing to God. As long as Jesus lay in the tomb he was just another tragic religious figure who suffered a martyr's death. But when God raised Jesus from the dead, it was His stamp of "paid in full" on the invoice of our sin debt. Now believing sinners can be certain that in Christ they are justified. 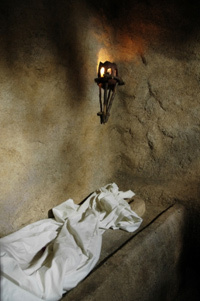 The Bible says, "He [Jesus] was delivered over to death for our sins and was raised to life for our justification" (Rom. 4:25). "If you declare with your mouth, 'Jesus is Lord,' and believe in your heart that God raised him from the dead, you will be saved" (Rom. 10:9). The resurrection of Christ assures us that there is life after death. John Knox in "Life In Jesus Christ" tells about visiting a church in eastern Virginia where his father had been a pastor fifty years earlier. Knox spoke of his father as a modest man of remarkable intelligence, charm, and extraordinary goodness. He said some of the older members of the church remembered his father quite vividly, but they were few, and as time passed they were becoming less and less so that there would finally be no one to remember his father. He said his father's name might be remembered because it had been memorialized on a church window, but it would still mean little or nothing to the succeeding generations. "Here is perhaps the supreme pathos of human life," Knox continued, "not that we die only but that any real and living memory must die, too. Unless God is to raise us from death it is the end as though we had never lived." How sad, but true! Yet the resurrection assures us that the God who raised Jesus to life again will do the same for everyone who believes in Jesus. The hope of immortality burns in every person's bosom. In the resurrection, this longing of the human heart merges with an irrefutable reason to believe in an after-life. The Bible says, "Jesus said to her, 'I am the resurrection and the life. The one who believes in me will live, even though they die; and whoever lives by believing in me will never die. Do you believe this?" (John 11:25,26). "Because I live," [said Jesus] you also will live" (John 14:19). The resurrection assures us that Christ is with us in the present. Some say that Phillips Brooks may be the greatest preacher America ever produced. Outside Of Trinity Episcopal Church in Boston there is a life-sized statue of the preacher under a half-dome within a portico. On the base of the statue are the words: "Phillips Brooks – Preacher of the Word of God – Lover of Mankind." The statue depicts Brooks standing next to his pulpit, one arm resting on it with the other raised in speaking. Towering above the preacher is the living Christ with his right hand resting on Brook's left shoulder. It's as if Christ is assuring Brooks that he must speak His word with boldness. It was this same confidence that emboldened the disciples of Jesus after the resurrection. Before they were full of anguish, anxiety, and even despair because of the tragedy of Jesus' death. But when the resurrection was apparent, they became confident they could face any challenge of life knowing the very one who had destroyed death had promised to always be with them. What test do you face today? If you trust the risen and living Christ, his hand will rest on your shoulder to give you peace, surety, and hope in any situation. The Bible says, [Jesus said], "And surely I am with you always, to the very end of the age" (Matt. 28:20). The resurrection assures us that we have an advocate in heaven. Just recently, a couple told me they had some legal problems and the Judge appointed them an attorney to advocate on their behalf in court. They expect now that they will prevail against an indictment levied by someone who intends to cause them much heartache and trouble. The Scriptures teach the devil is always accusing believers before the throne of God. We see this in Zechariah chapter 3, verses 1-5, and the book of Job, chapters 1 and 2. In other words, the accusations of the Evil One have to be answered. The good news is Christ now lives to stand at the bar of God to plead our case for all the sins committed after conversion. With every accusation and indictment by Satan himself, Jesus, with the very nail prints in his hands, argues that all of our trespasses are absolved by his own sacrifice. This is our guarantee that temporary falls shall not condemn us, but Christ always lives to intercede on our behalf. Jesus lives to implore the Great Judge of heaven that our faith in Him should never be in vain. The Bible says, "Who is to condemn? Christ Jesus is the one who died – more than that, who was raised – who is at the right hand of God, who indeed is interceding for us" (Rom. 8:34). "Therefore he is able to save completely those who come to God through him, because he always lives to intercede for them" (Heb. 7:25). The resurrection assures us of the necessary power to live as God requires. It's been said that Dr. Samuel Chadwick of England once announced a service for agnostics, atheists, and the like. A large crowd showed up. Many of them would not sing or bow their heads during prayer. They heckled the preacher when he shared his message. At the end of his sermon, Dr. Chadwick invited any honest inquirer who wanted to discuss religion to meet with him in his study. Surprisingly, nineteen of them showed up. Dr. Chadwick challenged them, "Suppose that we grant that your philosophy is sufficient for a man of moral character, social position, and economic security. What will you do for those who do not have these things, whose lives have been wrecked by destructive behaviors?" At that point, the spokesman for the group conceded, "We would bring them to you, for you have their only hope." Regardless of what the skeptics of the Christian religion may contend, they cannot deny the power of the changed lives in people who have met the risen Christ. By the same energy God used to raise Christ from the dead, God quickens, raises to new life, those who trust in Christ – enabling them to overcome negative behaviors that would otherwise enslave them with no hope. If you are not a Christian, if you are a doubter, can you honestly say you've never witnessed the genuine transformation that takes place in the life of someone who responds in faith to the Christian gospel? The resurrection of Jesus is the promise of a new life – a life that overcomes – a life that characteristically pleases God. The Bible says, "I want to know Christ – yes, to know the power of his resurrection" (Phil. 3:10). The resurrection assures us of the new bodies we can have some day. Some years ago I preached to a leper colony in India. People with withered limbs and broken bodies gathered beneath the shade of a tree for relief from the hot August sun. It was one of the most moving moments of my life as I watched hope lighten the dark faces of those who had never heard that one day Christ will grant new resurrection bodies to those who give their lives to Him. I told them that because Christ rose from the dead with a new and glorified body they could have the same. Our new bodies will be like Christ's resurrected body, a body incorruptible, a powerful body, a body not subject to disease, a body not subject to weakness or weariness, a body not subject to the same laws of time and space, but a body which will never fail and never die. Some of them wept with joy as they heard the good news and turned to Christ in faith. Perhaps you are living in a broken body and the doctors have given you no hope. The resurrection brings the assurance that a body riddled with pain, declining health and destined for near expiration, need not be the last word. There is the promise of a new body at the final resurrection when Jesus returns for those that love Him. The Bibles says, "For since we believe that Jesus died and rose again, even so, through Jesus, God will bring with him those who have fallen asleep" (I Thess. 4:14). "But our citizenship is in heaven. And we eagerly await a Savior from there, the Lord Jesus Christ, who, by the power that enables him to bring everything under his control, will transform our lowly bodies so that they will be like his glorious body" (Phil. 3:20,21). The resurrection assures us of a returning Redeemer-King. After His resurrection, Jesus, the Bible teaches, ascended into heaven to take his rightful place of authority at the right hand of God. But before leaving His disciples, an angel declared to them that the Christ of the resurrection would also be the Christ of returning glory. Billy Graham has rightly stated, "Thus the resurrection is an event that was both preparatory for and confirmative of a future event even of His second coming." Having already won His victory at the cross and His resurrection, Christ is waiting now only for the spoils of His conquest to be gathered. Although much of the world is chaotic and seems desperately in disarray, Christ already has his foot upon the neck of every enemy to God's will. Even the Apocalypse simply pictures Him entering upon the actual possession of His kingdom on earth. Be forewarned: This Christ who first came in humility will return in grandeur and splendor to judge the world in righteousness. Those who bow to Christ's lordship now will go into His forever kingdom of bliss. Those who spurn His offer of grace will be eternally judged and damned. Be ready, for the resurrected Christ is returning to claim this world, which rightfully belongs to Him. The resurrection is a promissory note of a coming Day of Judgment and redemption for the world. The Bible says, "They were looking intently up into the sky as he was going, when suddenly two men dressed in white stood beside them. 'Men of Galilee,' they said, 'why do you stand here looking into the sky? This same Jesus, who has been taken from you into heaven, will come back in the same way you have seen him go into heaven'" (Acts 1:10, 11). "For he [God] has set a day when he will judge the world with justice by the man he has appointed. He has given proof of this to everyone by raising him from the dead" (Acts 17:31). It is clear that everything about the Christian religion stands or falls with the bodily resurrection of Christ from the grave. If it were possible to show Jesus never rose again, the entire construct would crumble into dust. Thus, the Apostle Paul's statement, "If Christ has not been raised, your faith is futile; you are still in your sins. Then those also who have fallen asleep in Christ are lost. If only for this life we have hope in Christ, we are of all people most to be pitied" (I Cor. 15:17). But Christ is raised from the dead and anyone willing to openly consider the Bible's claims will discover that the preponderance of the evidence for the resurrection should lead one to implicit faith. What will you do with this Jesus who came back from the dead? Believe on Him, trust Him as your Savior from sin and death, make Him the Lord of your life, and all the assurances previously mentioned shall belong to you. Scripture references are from the New International Version and the English Standard Bibles.